Yunsheng Cheng grew up in a village in Anhui Province in China and received his bachelor's degree from Anhui Normal University. He is currently a graduate student at the Institute of Genetics and Developmental Biology, Chinese Academy of Sciences, where he studies how neurons transmit signals to other cells. 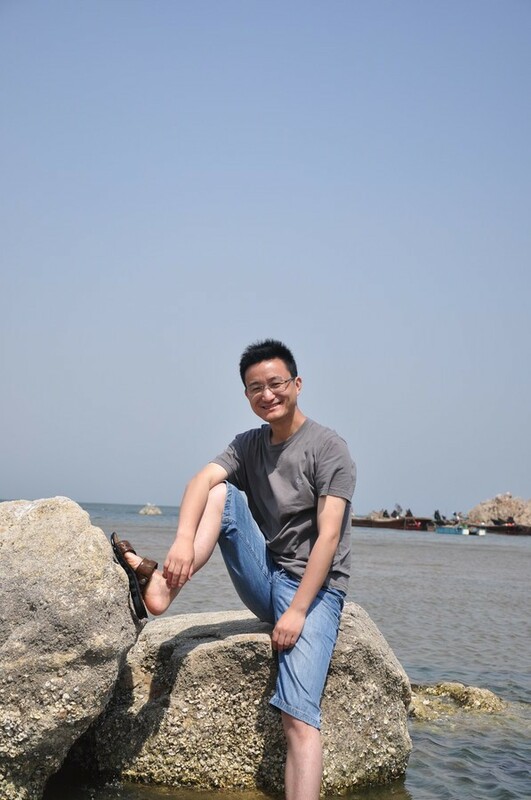 He enjoys listening to country music, and after he graduates he would like to pursue postdoctoral training abroad. Yunsheng Cheng in Beidaihe, HeBei province, China. Image credit: Yu Wang. What attracted you to studying genetics? When I was an undergraduate student, my genetics professor told us that genetics is just like detective work: it’s about finding clues to solve mysteries and finding logical connections between objects. I find this absolutely fascinating. Plus, genetic screens always seem to hold surprises for anyone who is looking for something new. How do you describe your research to your friends and family? I use metaphors. Generally I compare neurons releasing neurotransmitters—the chemicals they use to communicate with other neurons—to a ship unloading its cargo at a harbour. What I am doing is figuring out how the cargo—the vesicles that contain the neurotransmitters—can be released quickly but still in an orderly fashion, so that new cargo can be loaded for the next journey. What was the main finding in your recent eLife paper? We found that Synaptotagmin 1, a well-known sensor that detects calcium ions, could work as a molecular switch to control the activity and localization of a protein called Rab3 in the roundworm C. elegans (Cheng, Wang et al., 2015). Rab3 plays a very important role when the membrane of the vesicle fuses with the membrane of the neuron, which is a crucial step in the release of the neurotransmitters. Our findings may explain how a neuron can release neurotransmitters repeatedly. Why is this finding exciting? In the past, Synaptotagmin 1 was thought to primarily trigger fast membrane fusion. However, a synapse needs to release neurotransmitters both quickly and repeatedly, and how these two properties are harmonized was previously unknown. Our findings provide a possible answer to this question: Synaptotagmin 1 could regulate fast neurotransmitter release through protein complexes that help tether vesicles to the neuron membrane called SNAREs, as well as regulating repeatable release by controlling Rab3 activity. Currently, we are trying to check whether the process we found in C. elegans—the regulation of the Rab3 cycle by Synaptotagmin 1—is also conserved in mice. What has been your best moment in the lab? It would be the day when I found that Rab3 lost its normal distribution in Synaptotagmin 1 mutant worms. Before that, I had spent a year and a half and had done three rounds of genetic screening looking for some new regulators of Rab3 activity and localization. Coincidently, the day I found the mutant was my birthday. There have also been some bad moments in the lab, for example, when results have turned out to be inconclusive. Once, I needed to check the phenotype in a double mutant worm, but the mutations killed the worm. I think everybody doing genetics faces problems like this. It pushes me to find another way to solve the problem. Who has most influenced your career so far? My advisor Dr Mei Ding. She is intelligent and has a passion for science. And, the most important thing is that she has taught me to enjoy science. What single change would most improve the way that science is done today? Interdisciplinary science has made exciting discoveries, like finding the structure of the DNA double helix. Maybe in the future, neuroscientists could co-operate with physicists and computer scientists and make our brains work as fast as computers. What advice do you have for other early career scientists? Keep asking the question “What’s next?” Because it is the depth of your mind and your thinking that decides how far you can go. What do you plan to do once you have graduated? I’d like to further my studies in neuroscience, and have one or two rounds of postdoctoral training abroad. Global communication and co-operation is part of everyday life in science, and I hope to gain many benefits from experiencing new cultures and meeting new people. What are your main interests outside science? I like to watch football. I think the mutual competition and co-operative team spirit of football is just the same as what we face in scientific research. Do you find it difficult getting the life-work balance right? Sometimes, but with the help from my family and friends, I think I do pretty well. Where would you like to be ten years from now? Well, that’s a long time from now. At that time I hope I could be a lab leader working on neuroscience in a university in the south of China. New technologies like Optogenetic or CLARITY give us the chance to study the structural and functional connections in human brain. Ten years from now, the connectome—the map of neural connections—of our brain may be finished. I hope that in the future, scientists (maybe including me) could finally find ways to improve our learning and memory ability. Before I entered this lab, I thought I was going to study botany. One day, a friend of mine told me that the Ding lab needed some interns, so I took the chance. And now I am doing neuroscience. 2008–present: PhD student, Institute of Genetics and Developmental Biology, Chinese Academy of Sciences. Beijing, China. 2004–2008: Bachelor Degree in biotechnology, Anhui Normal University. Anhui province, China.